Enough with huge scenes after the credits. I hate it. A lot of people turn it off when the credits roll. Sherlock did almost the same thing. HUGE scene in the season finale but in their case they halted the credits one second after they started. I don't wanna have to get in the habit of waiting for the credits, especially in movies, to finish because 1 out of 100 times there will be a huge scene afterwards. Just caught the new ep. Pretty damn good. Who thinks the head dude from terminus will be heard from again? Negan maybe? Don’t think he’s supposed to be Negan but from the previews/teasers out there it looks like he plays a role in a future episode(s). No, I don't think so. I don't think we see Negan at least until the end of this season, and maybe not till the end of next season. In the books, he doesn't show up until they're totally settled at Alexandria Safe Zone, which is outside DC. Don't think he's Negan either, but I definitely think he'll be back. Rick clearly didn't get a kill shot on him. 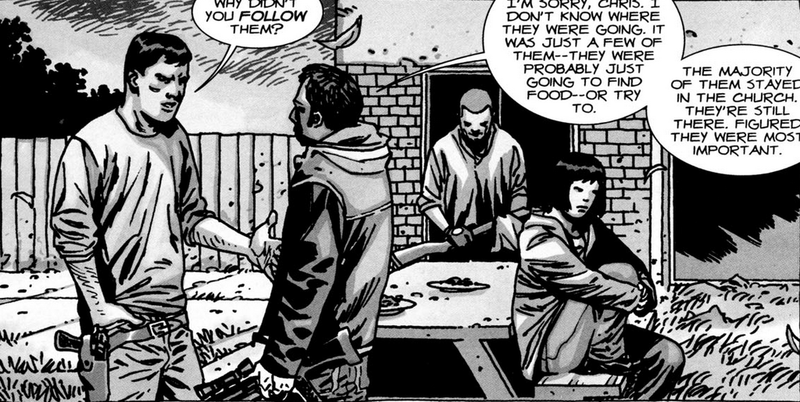 They also made that big deal about how Rick was going to kill him with the machete from the cache (at least I think that's the weapon he said he would kill him with). Yes, machete with a red handle. Oh, good call. That church is the priest's right? We saw Gabriel in the trailer for next week. Yeah, he doesn't fit the profile really but we know how they like to jump around the story. Rick shoulda finished that cocksucker off. They have made a point of foreshadowing the whole series. I have no doubt at some point he'll split that man's skull with a machete. They've diverged from the comix a lot but after the fact I really can't complain. They've balanced that wire of being true and mixing it up very well. And I doubt it will but the performances deserve award nomination. If you forget the subject matter (horror, zombies, etc) people keep tuning in for the characters. I realize Laurie Holden isn't a favorite around here but I still found this interesting. To me, it leaves two burning questions. How is Morgan going to be involved? What does the BAMF ginger plan on sharing when the time is right? Oh, and I would take Carol to pound town - first class, no questions asked.